The Chinese Football Association (CFA) apologized to Chinese fans for the Olympic team's early exit from 2012 London Olympics qualifying on Friday and said it will make a greater effort to develop the sport. "We are sorry that the Chinese Under-23 team missed the opportunity to claim a berth at the London Olympics after losing to Oman on Thursday," the CFA said in a newsletter posted on its official website on Friday. "We sincerely apologize to the fans and take responsibility for the defeat. The CFA is willing to accept all suggestions and criticism from the society. "The development of Chinese soccer has stumbled through a lot of problems and we must work hard to find solutions," the CFA said in the letter. "The poor foundation of teenage soccer has led to a shortage of domestic soccer talent, which has directly affected the overall competitiveness of the sport. We will work hard to reverse the situation." 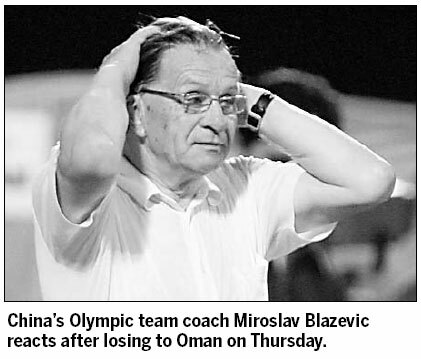 After being stunned 1-0 by Oman on home soil on Sunday, Miroslav Blazevic's team was determined to fight all the way in the second clash, but with little teamwork, simple long passes and poor individual skills, the task proved to be too great. The team's elimination was not an isolated event as same generation has already suffered a series of embarrassing defeats. The squad was eliminated by Uzbekistan at the quarterfinal stage of the 2008 AFC U-19 Championship, and thus missed the FIFA U-20 World Cup held in Egypt the following year. 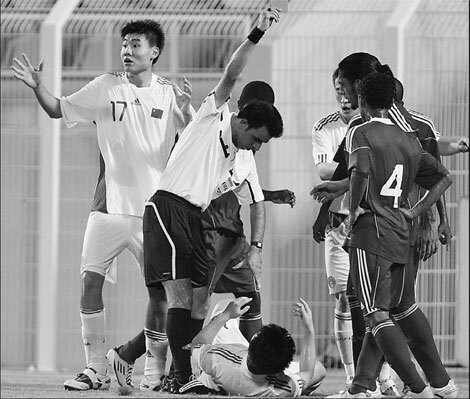 At the 2009 East Asian Games, the Chinese Olympic team was thrashed 3-0 by a so-called South Korean amateur team, which was thumped 4-1 by Hong Kong in an earlier game. China finished bottom after two group matches and was then dubbed by critics as "the worst Olympic team in history". One year later, the team started its Asian Games campaign in Guangzhou with a 3-0 loss to Japan and was later eliminated by South Korea by the same margin in the first knockout round. Wei Di, who took over the CFA last January, has acknowledged the country is lagging behind in the sport and said the association will pay more attention to teenage soccer. "The popularization of soccer should start with children," Wei told Chinese newspaper Beijing Times. "The training system of Chinese teenage soccer has slipped into a state of paralysis over the past few years, and we are beginning to pay for the mistakes now." Besides loopholes in the training system, Wei said another aspect that hurt the development of Chinese soccer was a shortage of international experience. "Taking the Olympic team as an example, it is lacking experience on the field. You cannot make progress merely by training," the paper quoted Wei as saying. "According to our statistics, the CFA currently organizes about 44,000 matches a year, while the association of Germany organizes more than 70,000 games annually; that's a huge gap." According to China Sports Daily, there were more than 650,000 players under the age of 18 registered with the CFA in 1995. However, that number dwindled to 30,000 in 2007. The players on this Chinese Olympic squad were selected from a pitiful 320 players. Meanwhile, Asian counterparts Japan and South Korea have more than 100,000 registered players at that age.